Andrea Doria, an Italian admiral from Genoa, was one of the most successful genoese soldiers. He served in the papal guard and under various Italian princes. As young, he took part in the rising of Genoa against the French. Different circumstances brought him in the service of King Francis I of France, who made him captain-general, but dissatisfied with his treatment under King Francis, he entered the service of Emperor CharlesV. Later on Andrea Doria expelled the French and re-established the republic under imperial protection. It's interesting that he refused to take the lordship of Genoa and even the dogeship (duke of Genoa), but accepted the position of censor, and had important influence in the councils of the republic. He earned a lot of privileges in Genoa and a title of Liberator and Father of his Country. Doria also commanded several expeditions against the Ottoman Empire even in his old age (he was over seventy years old). Due to his great wealth and power, and his arrogant nephew, Doria was a victim of several conspiracies. Even though he was very old, he showed no mercy towards the conspirators and defeated them all. He died at the age of 94. There are several extraordinary villas in Genoa sponsored by Andrea Doria. One of them is Villa del Principe, the palace of Andrea Doria at the Piazza del Principe 4. There's no need for the great presentation of this really World Wide Famous character. He's the one who has made Europe aware of the existence of the American continents, although he wasn't the first one to put his foot on the land of the indigenous Americans. Though there are different theories about his origin, the academic fact is that Columbus was born in Genoa in 1451. If you're about to visit Genoa, you're gonna have the opportunity to visit his home-museum in Piazza Dante. It is the reconstruction of his original medieval house that was destroyed in the 1684 bombing. As the son of the local wool weaver, he helped his father in his early age, but soon started to follow his passion and work as a sailor. Being very insistive he managed to persuade Isabella I of Castile, the queen of Spain, to finance his trip to the Indies, promissing her to find much shorter way for the East and assure the entry of Spain into the spice trade. His first trip took place on august 1492, when he took off of the Spanish coast with three well known boats: Nina, Pinta e Santa Maria. October 12th, 1492 is the official day when Americas were found and also the date of the start of the Modern Era. It is celebrated in Spain and Americas as Columbus Day. From 1492 until 1504 Columbus made three more expeditions taking a lot of monks, doctors and farmers to the New Found World. The Spanish crown was satisfied by his sailing and admiral skills, but preoccupied for the fact that Columbus was defending the rights of the Native Americans against Spanish abuse, and so they sent one of their man, Francisco De Bobadilla, to bring justice to the Spanish colonies. He arrested Columbus and sent him back to Spain. Though he got out of prison, he spent the last part of his life in private, away from eyes of public. He died in 1506 at Valladolid in a difficult financial situation and never actually learned that he found the New Continent. How ironic. Fabrizio de André was a famous Italian singer and songwriter from Genoa. Born in 1940, he spent his early childhood in Piedmonte, because his father was an anti-fashist and partisan, and, pursued by the police, needed to get away from Genoa for a while. When the war was over, the de André family came back to their home. Maybe this episode of his life influenced some of his work in which he often spoke about marginalized and rebellious people. As young, de André first practiced the violin, then the guitar until he finally started developing his passion: being part of a jazz band. At the age of 21 he recorded his first two songs: "Nuvole barocche"("Baroque clouds") and "E fu la notte" ("Then night came"). The next year de André married Puny Rignon and his first son Cristiano was born. Cristiano will follow his father's path and become a musician. This was the period when de André started writing a lot of songs and became known to a larger public. Some of the hits from this period are: "La ballata dell'eroe", "Via del Campo" named after a famous street in Genoa, "Carlo Martello ritorna dalla battaglia di Poitiers" which was written with his very close friend and famous Genoese actor Paolo Villaggio. After a while de André divorced Puny and started a relationship with the folk singer Dori Ghezzi, who will be his second wife and the mother of his second child, Luisa Vittoria. De André collaborated with different famous italian singers and musicians like Mina, Francesco de Gregori, Massimo Bubola, the progressive rock band Premiata Forneria Markoni (PFM). When he was on the tour organizing a number of concerts with the PFM, something terrible happend: he and Dori Ghezzi were kidnapped for ransom by a gang of Sardinian bandits. They were held in the Supramonte mountain for four months, when the ransom was paid. Soon after their release de André restarted with his work. In 1984 he wrote one of his most famous albums "Creuza de ma" ("Path to the sea"). In writing this album he returned to his native Genoese dialect which he will be using in his songs in the years to come. De André's last original album is "Anime salve" ("Saved souls"). It was issued in 1996, two years before he was diagnosed with lung cancer and died on January of 1999. He was buried in Genoa in the family chapel. 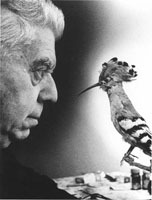 Eugenio Montale, an Italian writer and winner of the Nobel Prize for Literature in 1975, was born in Genoa in 1896. He had not a possibility to have a university education, but since he had a great passion for literature, he was a self-taught man. He used to go and listen to his sister lessons. Montale also studied opera singing with the baritone Ernesto Sivori. At his poetry beginnings, Montale was influenced by the rise of the fascist regime. His first poetry collection "Ossi di seppia" ("Cuttlefish Bones") were published in 1925. The Ligurian landscapes, the zone of Cinque Terre where his family had a summerhouse, were frequently present in his early work. Important for his further work is his moving to Florence in 1927. Montale started working as editor. He was asked to be a chairman of the Gabinetto Vissieux Library, but was expelled several years after by the fascist government. In the meantime he wrote for almost all the important literary magazines at the time. He also published in Florence one of his fines anthologies "Occasioni" ("Occasions"). In this period he was influenced a lot by Dante and T.S. Eliot. After the Second World War was finished, Montale moved to Milan, where he worked for Corriere della sera as a music editor and reporter from abroad. Montale received honorary degrees by the Universities of Milan, Cambridge and Rome. Besides his literature successes ("La bufera e altro", "Xenia" "Satura", "Quaderno di quattro anni"), Montale was named Senator for Lire in the Italian Senate. He died in Milan in 1981. In 1996 was published another his work "Diario Postumo", but some scientists doubt its authenticity. No matter you go to Genoa, Naples, Rome, Catania, Alesandria, or even England and New York, you can find different monuments of Garibaldi. He was an extremely important person for the unification of Italy, if not the most important. But not only. He's remembered also in Brazil, America and Uruguay where he unselfishly helped the independence war. An able soldier, anti- tyrant, passionate husband, Garibaldi dedicated completely his life to the fight for freedom. He was born in Nice on the 4th of July (how symbolic!) 1807. Since young he stared living as a soldier. He took part at the Carbonari, Italian patriot revolutionaries, and la Giovane Italia, the secret political society founded by Mazzini. Garibaldi and Mazzini met personally and though they were fighting for the same cause, but with different approaches, their relationship became rather troublesome. Garibaldi, like Mazzini, was sentenced to death in absentia by a Genoese court. A lot of his life he spent in exile, which brought him to take part in Latin-American wars. There he met his first wife Anita, who courageously stood by him in many battles. Garibaldi turned to Italy when the revolution of 1848 started and offered his services to Charles Albert of Sardinia, but the First Italian war of Independence was unsuccessful. After the epic march to Venice to help the Venetians in their resistance to the Austrians, he was forced to take refuge in San Marino. The way was very difficult, they were hunted and exhausted and brave Anita carrying their fifth child died near Comacchio. After a while Garibaldi was forced again by Piedmontese government to emigrate abroad. He moved on to Staten Island in New York. His house still exists and is made a museum now. It's listed on the U.S. National Register of Historic Places. Garibaldi returned again to Italy in 1854 and bought half of the Italian island of Caprera, in Sardinia. He made his home there and retreat several times after numerous battles. In the Second Italian War of Independence Garibaldi was appointed major general and formed a volunteer unit named the Hunters of the Alps. By that time Garibaldi abandoned definetly Mazzini's republican ideals. In this period Garibaldi's second marriage arrived, which was very brief. He married an 18-year old Lombardian girl but the same night of their marriage she told him she was pregnant with another man's child. For the occupation of the Two Sicilies, Giuseppe Garibaldi gathered about a thousand volunteers popularly named I Mille (the Thousand) Redshirts. He was accepted with more celebration than resistance. It was very well known that Garibaldi deeply disliked the Piedmontese Prime Minister Camillo, conte di Cavour, for trading away his home city of Nice to the French. Garibaldi also entered in conflict with Victor Emmanuel because he was disapproving about Garibaldi's challenge against the Pope. He sent a division of the regular army to stop Garibaldi and the battle happened near Aspromonte. 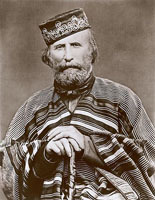 Garibaldi forbade his men to return fire. Many of them were taken prisoner, including Garibaldi, who had been also wounded in the leg. The news on Garibaldi's imprisonment was fastly spread in the national and international newspapers. The public was shocked. Luckily he was held in a sort of honorable imprisonment. After he was released he returned to his island of Caprera. In the third and last Italian War of Independence, Garibaldi had the full support of the Italian government, and managed to defeat the Austrians. Garibaldi was elected to the Italian parliament, but he spent much of his last years in Caprera where he died on June 2nd, 1882. He remained known to the people as the "Hero of the two worlds". 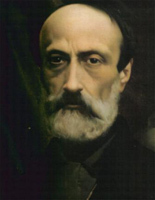 A very well known patriot, philosopher and politician, Giuseppe Mazzini was born in Genoa in 1805. Genoa at that time was a part of the Ligurian Republic, under the rule of the French Empire. Since young, he was very active patriot, who fought for the unification of Italy. According to him, the nation had to be: "One, independent, free republic". He had been arrested several times in his life, because of his adherence to a secret association with political purposes, called Carbonari. When he got out of prison, he started his new fase in life, fighting for the union mostly from abroad. When he went to Marseille, he founded a secret political society La giovane Italia (Young Italy). He had collaborated many times with Garibaldi, but at the end, the two had very different notions on how the fight for the union of Italy should be carried forward. A lot of his time he spent in exile in London, where he also founded the association Amici di Italia (Friends of Italy) to attract consensus towards the Italian liberation cause. Since he didn't agree with the course that Italian liberators and Garibaldi took, he refused a seat in the Italian Chamber of Deputies offered by the new Kingdom of Italy which had been created in 1861 under the Savoy monarchy. In 1870, during an attempt to free Sicily, Mazzini was imprisoned one last time. Though he died in Pisa in 1872, Mazzini's funeral was held in Genoa, and more then 100.000 people took part in it. Mazzini's house in Genoa, situated in Via Lomellini 11, is now seat of the museum of risorgimento and of the mazzinian institute. When we think about the achievements of Goffredo Mameli, it's difficult to imagine that his life ended two months before his 22nd birthday. Born in Genoa in an aristocratic Sardinian family, in two last years of his life, he played important parts in insurrectional movements and the Risorgimento. At the age of 20 he became a member of a cultural movement that soon turned to a political movement. He was interested in the liberation of Italy and Mazzini's theories. He was admitted to Garibaldi's irregular army, and took part in different battles beside Nino Bixio. But the thing he's most known of is the Italian national anthem. Mameli is the author of "Il Canto degli Italiani". His death came too early, when he was accidentally injured in his leg, and died of an infection. Nino Bixio was an important Genoese who fought for the Italian unification. He started his military career as a boy in the navy of the Kingdom of Sardinia. In 1846 he joined the Giovane Italia, a secret political society founded by Mazzini. He was very significant in the liberation war. Became captain under Garibaldi, he gained the gold medal for military valour. Bixio was also important in politics. He was elected deputy, and appointed senator in February 1870. Nino Bixio died of cholera in Sumatra. In Genoese quarter Carignano proudly stays a statue of Nino Bixio. Niccolò Paganini was a controversial Genoese violinist, guitarist and composer. His great virtuosity was considered a mysterious pact with the devil. Still, Paganini left his mark as one of the pillars of modern violin technique. His musical talent was discovered when he was very young, which earned him a lot of scholarships for violin lessons. Thanks to his great talent, at the age of 18 he became first violin of the Republic of Lucca. Some doctors say that there is a scientific explanation for Paganini's extraordinary capabilities in playing violin. His flexibility and his exceptionally long fingers may have been a result of Marafan syndrome, which is a genetic disorder of the connective tissue. Paganini's next success was becoming a violinist for the court of Napoleon's sister, Elisa Baciocchi. At the time, he was giving also private lessons for her husband Felix. When Elisa Baciocchi became the Grand Duchess of Tuscany and moved to Florence, Paganini was part of the entourage, but after two years he left the court to resume his freelance career. He worked a lot and became famous all around Europe. His reputation as a great musician was accompanied by his reputation as a gambler and womanizer. All of his life, he was both complimented and criticizes at the same level. Paganini composed his own work to play exclusively in his concerts. It's very interesting how his compositions were technically imaginative. He often imitated sounds of different instruments and animals. In his composition "The Spanish Dance" he imitated al lot of sounds of farm animals. 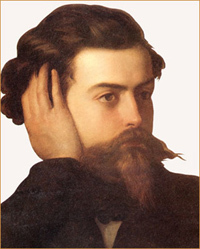 More sensual is his composition "Duetto Amoroso" where he imitated the sighs and groans of lovers. It is sad to say that there are no manuscripts of either piece. One of his most famous composition is the "24 Caprices for solo Violin". Throughout his life, Paganini was affected by a numerous serious illnesses, some of which are syphilis and pulmonary tuberculosis. 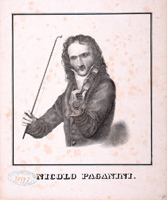 Though he was cured, his career suffered it, and Paganini decided to put an end to his concerts and devote his time to the publication of his compositions and violin methods. He also gave lessons to some violinists like Camillo Sivori and Gaetano Ciandelli. His passion for gambling resulted in opening a casino in Paris, but it was an immediate failure that left him in financial ruins. He spent last years of his life being ill, but he refused the Last Rites to be preformed on him from the local parish, so when he died in 1840 from internal hemorrhaging, his body was denied a Catholic burial in Genoa. His remains were finally put to rest in 1896 in a cemetery in Parma, after a couple of exhumations preformed in these years. It's interesting that there's a minor planet 2859 Paganini. That's a main-belt asteroid that was descovered in 1978 by Nikolai Stepanovich Chernykh and named after our famous musician. Most probably there is no Italian that hadn't seen at least once in his life the famous Fantozzi, the cult of Italian cinematography. Paolo Villaggio, well known Genoese actor, famed ironical and satirical writer and director, created his most famous character Ugo Fantozzi out of his personal experience when he worked as clerk for the Italsider steel major. Villaggio was discovered by Maurizio Costanzo, famous Italian TV journalist, who advised him to take part in a cabaret in Rome and so his great career started. He made his experience in TV, and started writing for L'espresso, a popular Italian magazine, short stories based on the character Accountant Ugo Fantozzi. Villaggio worked with some very famous directors like Federico Fellini, Lina Wertmuller, Gabriele Salvatores. He was awarded with David di Donatello in 1990, the Nastro d'Argento in 1992 and the Golden Lion for his entire career in 1996. Villaggio also wrote a song "Carlo Martello torna dalla battaglia do Poitiers" with his close friend Fabrizio de André. Paolo Villaggio still lives and works in Rome. Renzo Piano is a world wide known architect born in Genoa in 1937. He studied at the University of Architecture in Florence and Milan, and graduated at Politecnico in Milan. Afterwards he travelled a lot from the USA to England to complete his studies and work formation. He worked with many famous architects all over the world. When he met Richard Rogers they founded the studio "Piano & Rogers" situated in London. Their most famous project is the Centre Georges Pompidou in Paris. After he finished his collaboration with Rogers, Piano started with Peter Rice the Atelier Piano & Rice. In 1988 the City of Genoa employed him to reconstruct the Porto Antico, the famous Genoese seaport for the Expo '92 Genova, the celebration of the 500 years of the discovery of America. The work included also the Aquarium of Genoa and Bigo, the panoramic elevator. Another important work of his is the Auditorium Parco della Musica, a large multi-functional public complex to the north of Rome. It is situated in the area where 1960 Summer Olympic Games took place. 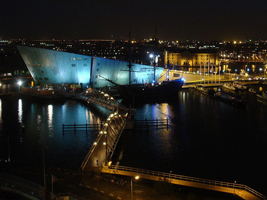 Renzo Piano is the author of the largest science centre in Holland - NEMO Science Centre. He created one of the most famous buildings which is known all over the world: the Shard London Bridge, also known as the London Bridge Tower. It was finished during the year 2012, and it is the tallest building in the United Kingdom, and one of the tallest in Europe. Renzo Piano won some of the most prestigious prizes and acknowledgements in the world of architecture: Royal Gold Medal for Architecture, U.K. (1989), Kyoto Prize (1990), Goodwill Ambassador of Unesco for Architecture (1994), The Pritzker Architecture Prize, The White House, Washington (1998), Médaille d'Or UIA, Berlin (2002), Gold Medal AIA, Washington (2008).